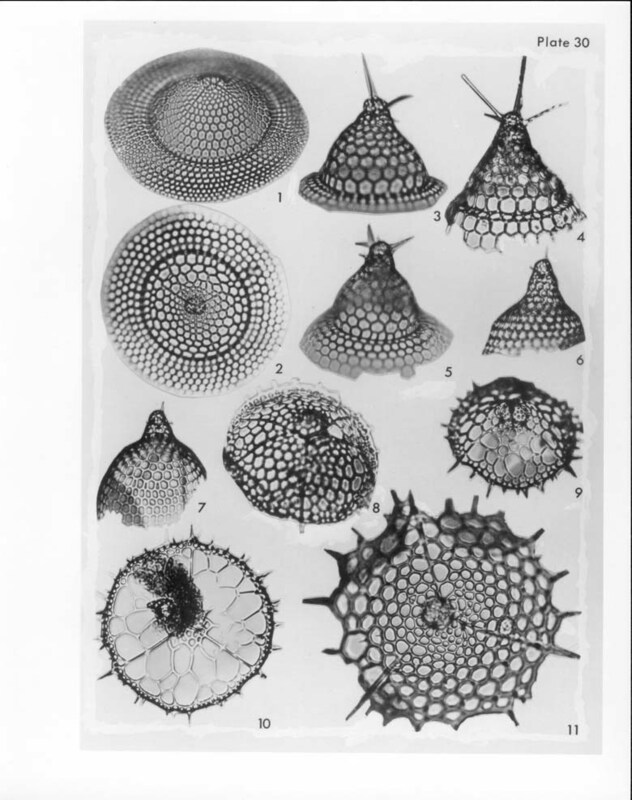 1-2 Theopilium tricostatum Haeckel; 1, oblique view from above, VS-R-60b, 3-5cm, W15/0, 300x; 2, apical view, VS-R-60a, 3-5cm, E4/0, 300x. 3-5 Coracalyptra cervus (Ehrenberg); 3, right lateral view, VS-R-34a, 3-5cm, M8/1, 300x; 4, left lateral view, VS-R-91Bb, 1-3cm, C35/0 , 300x; 5, right lateral view, apical horn forked, VS-R-34a, 3-5cm, G29/4, 300x. 6-7 Eucecryphalus sp. ; 6, left lateral view, VS-R-192b, 1-3cm, T34/2, 300x; 7, left latero-ventral view, VS-R-191a, 1-3cm, C35/0, 300x. 8-10 Lampromitra cf. coronata Haeckel; 8, oblique basal view, primary lateral thoracic ribs bifurcated, VS-R-46b, 1-3cm, U19/4, 300x; 9, ventral view from above, VS-R-91Bb, 1-3cm, D31/1, 300x; 10, apical view, dark area is sediment, VS-R-60b, 3-5cm, G34/4, 300x. 11 Lampromitra quadricuspis Haeckel; apical view, VS-R-106b, 1-3cm, D34/2, 300x.